You know, I have been missing my schedules of posting a recipe a week. I am not quitting this commitment (yes, keeping a blog is a sort of commitment), it just lately I have been failing at cooking good recipes and or failing at taking a good picture of the success meal itself. 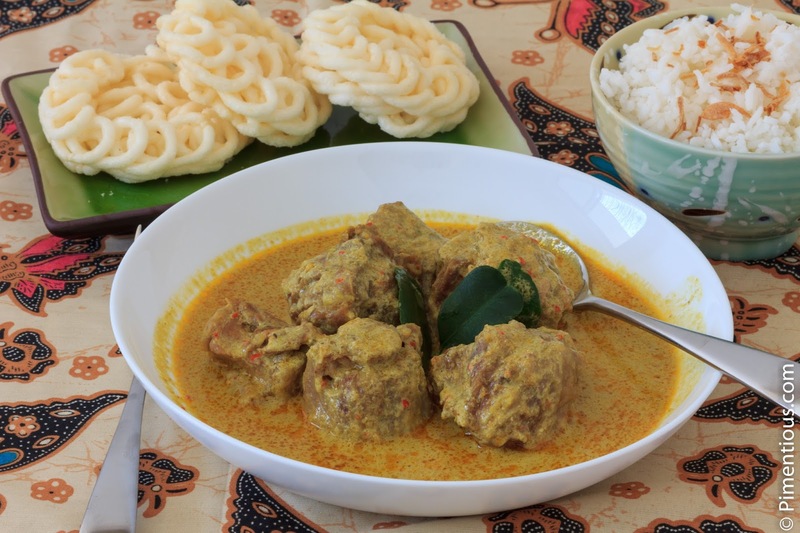 However, I managed to successfully cook this yummy veal oxtail curry (Gulai Buntut). Yes, gulai always, always needs a lot of spices, but that's the key to its rich flavor. I cooked this curry for hours on low heat in a Dutch-Oven (slow cooking pot). The veal oxtail became so juicy and and tender, the meat was easily undone yet it still had a slight of chewy-ness from it's tendon-y part. And the sauce, ogawd it was delicious, packed full of flavors. Put the lid on, lower the heat and continue cooking until the meat is tender enough to your liking, stir from times to time. Once the oxtail meat is tender enough, continue cooking for a few more minutes without the lid to let the water evaporates and the sauce thickens. Et voila, this flavorful curry is ready to be served with a bowl of cooked rice !